This is one of the annuals I have been planting this week. This year as been funny since I have had more requests for annuals then ever before. It truly has been the year of the annual. I don’t mind because annuals always add a lot of color to the garden. I hope to take some more pictures of the different flowers I have been planting. Dahlias, Impatiens, Petunias, Marigolds, Salvia, Cleome and Begonias to name some of the species for this year. 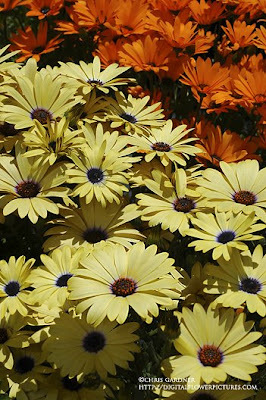 Cape Daisy is a nice annual for masses or containers. I like them since they aren’t too fussy and seem to give good color throughout the season. I found that they need full sun and well drained soil. If they start to slow down blooming some light shearing maybe in order. They benefit from deadheading (removing the spent flowers). These plants have been in full bloom since they came from the nursery. I once showed a picture I took of one of these flowers to a friend from California and he said, “Ugh, those are freeway daisies”. I just thought to myself you are lucky to have that beautiful a plant growing along the highway. There is 2 to 3 inches of rain expected for this area today. We could use some rain but not that much. I would like a day off but I have to get more plants and I have found that a lot of the wholesale nurseries are not too busy when it is raining. I love Osteospermum. 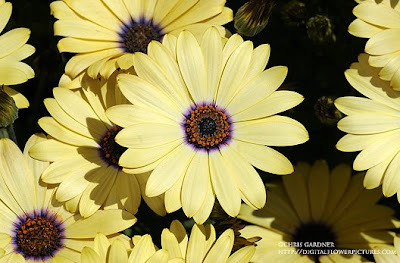 I have a Dimorphotheca that is called African Moon. I used to hate the way daisies looked but now I'm in love. I'd had customers at work refer to them as the California highway daisies all the time. Good morning. Good luck working in the rain! 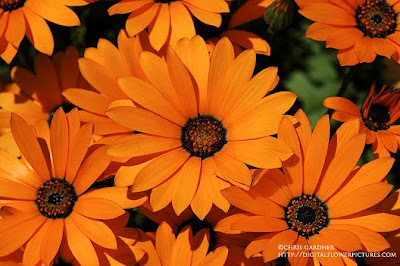 Daisies are great, Their beauty is in their timelessness and simplicity. How did you get yours to bloom? Once the initial flowers my plant had when I bought it died, no new ones have come since! In fact my plant has aborted all new flower buds it had when I bought it. I have it in full sun in 8b where temperatures have been getting up to the mid to high 90's. I readonline that this plant requires cold night temps to bloom. Is this true? Thanks! P.S. your pictures are beautiful!